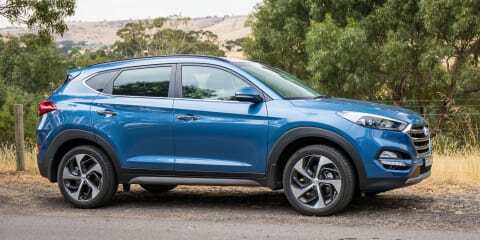 The Hyundai Tucson is Australia’s second most popular SUV behind the Mazda CX-5, ergo one of the market’s top-selling vehicles full stop. By contrast, the newly renamed Ford Escape (nee Kuga) is a perennial underachiever, highly regarded critically but comparatively ignored by buyers. We want to investigate whether this discrepancy is justified. To do so, we’ve tested each model in its highest level of specification, with petrol engines that take the lion’s share of the segment. 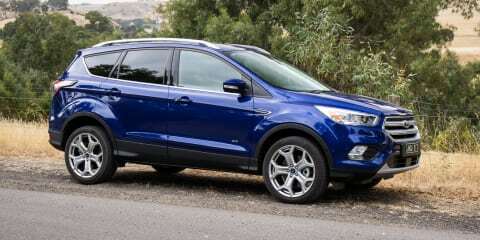 So we have the Hyundai Tucson Highlander versus the Ford Escape Titanium. There’s nothing in it in terms of price, with the Ford costing $44,990 before on-road costs and the Tucson listed at $45,450. Common equipment includes 19-inch alloy wheels; rear-view camera; front/rear parking sensors; front, side and curtain airbags; outboard ISOFIX anchors; and five-star ANCAP ratings (2017 date stamp for the Ford, 2015 for the Hyundai). Both also have proximity keys; 8.0-inch touch-screens; satellite-navigation with live traffic updates; Apple CarPlay/Android Auto (just added to the Hyundai as part of a running change); USB/Aux/12V; and Bluetooth phone and audio. Furthermore each has leather seats with electric adjustment and heating for front occupants; cruise control; LED cabin lighting; dual-zone climate control; glass roofs; electric tailgate; rain-sensing wipers; dusk-sensing headlights; privacy glass; and roof rails. Unique to the Hyundai Tucson as standard is Autonomous Emergency Braking (AEB); blind-spot monitoring; lane assist; and rear cross-traffic alert. Note: all of these features can be had on the Ford Escape, but you’ll need to pay $1300 extra for the Tech Pack (we recommend you absolutely buy this, and we are disappointed that Ford isn’t offering it as standard), which also adds radar-guided cruise control and a tyre-pressure monitor. The Tucson alone also has a full-size spare wheel; electric seat adjustment for the front passenger; and seat cooling as well as heating. The Ford Escape’s unique standard features include an additional knee airbag; Emergency Assist; and a programmable MyKey. Winner: Hyundai, for its active safety tech and full-size spare. Just. The Tucson’s rather austere interior design places the emphasis on practicality, ergonomics and quality rather than flair. There’s nothing adventurous going on, but key touch-points are pleasant for the tactile-minded and the plastics are well put together. Our test car had a 8.0-inch touchscreen with integrated sat-nav (up free updates for a stint), but in welcome news Hyundai has since added Apple CarPlay and Android Auto compatibility. Connectivity includes an improved Bluetooth quality over the first iterations and two 12V inputs, though our tester still lacked Hyundai voice control (the new Apple/Android mirroring brings this). Listen to the Bluetooth quality of the Ford Escape and Hyundai Tucson, and subscribe to the CarAdvice podcast here. We like the extensive amount of cabin storage in the doors and below the fascia, and the fact that unlike the Ford, the Hyundai gives you electric adjustment for the front passenger seat, plus ventilation for both front occupants. Australia needs this more than mere seat heating. The Ford Escape sports what is unmistakably a more distinctive interior design, though the trade-off for its ‘sportier’ feel is reduced knee room thanks to the protruding centre stack. And while the colour palette isn’t quite so monochrome, the materials feel cheaper and flimsier, especially the stuff flanking the screen and gear shifter. Our tester had a pillar squeak, coming from interior trim. The SYNC 3 system familiar from a host of other Ford is excellent, with conversational voice control and CarPlay/Android Auto, better navigation graphics and superior audio quality. You also get two USB inputs over the Tucson’s one. That chintzy blue-green font on the climate control is so 1986, though. We imagine the Ford has more immediate appeal, but Hyundai’s interior is the definition of a grower. Given the positioning of both of these vehicles as family-friendly offerings, the comfort in the back seats and the practicality of the cargo area is just as vital. The Tucson has a little more space in the back row than the Ford, and the hard plastic seat backs (while unpleasant to touch) are easier to keep clean and stop you poking the back of the driver/passenger with your knees. As with the Ford, the rear seats recline slightly, though unlike the new Volkswagen Tiguan, have no sliding function to liberate more useable cargo space or pull a child-seat closer to you, in the front. Amenities include rear air vents, individual LED reading lights for outboard occupants, hand grips, a flip-down centre armrest and big door pockets for bottles. Neither model here has levers to flip the back seats from the cargo area as offered in a Mazda CX-5 (which also has a more clever 40:20:40 folding seat configuration), though the Tucson gets maximum points for accommodating a full-size matching spare below the cargo floor. The Kuga offers less space for taller rear occupants, in terms of knee- and shoulder-room, though it’s hardly tight and will still accommodate two adults. You also get nifty little flip-up tables mounted to the front seat-backs, and while the glass roof isn’t as massive as the Hyundai’s unit, it does slide and tilt. All four windows are one-touch-operated though they’re smaller than the Hyundai’s and therefore the rear feels less spacious. As you can see, the larger part of the Ford’s 60:40 folding rear seats is on the kerb side, unlike the Hyundai which does it the other way. As you can read in the table below, the Ford offers slightly less cargo space and no full-size spare, though, like the Tucson, its electric tailgate has a hands-free operation option for full hands. Winner: Hyundai, by the skin of its teeth. The Ford clearly outguns the Hyundai when it comes to power, thanks to its 2.0-litre turbo-petrol producing a very healthy for the class 178kW (at 5500rpm) and 345Nm (from 2000rpm). By contrast, the Tucson’s 1.6 turbo-petrol makes 130kW (at 5500rpm) and 265Nm (from a low 1500rpm). Small wonder lots of buyers opt for the $2000 pricier diesel with its 136kW/400Nm punch. Despite its portly 1751kg kerb weight, the Ford definitely wins in terms of performance. Power delivery is excellent right through the mid-range, with hot hatch-rivalling straight-line pace, while the engine is refined when relaxed and sonorous under heavier throttle. This is helped by the well-calibrated six-speed automatic with torque converter that is generally intuitive under dynamic driving conditions, and relaxed and jolt-free in stop-start situations. However, claimed combined-cycle fuel use is a high 8.6L/100km, though in average driving you can expect closer to 10L/100km – nothing comes without consequence. Like the Hyundai, the Ford gets a front-biased on-demand all-wheel-drive (AWD) system that shuffles torque to the rear when the onboard computer detects traction loss. The Hyundai’s engine, which is similar to that in the Veloster SR and Elantra SR, is by comparison a little underdone next to the Ford, or for that matter a Volkswagen Tiguan (either in 132kW/320Nm or 162kW/350Nm tunes). On the other hand, the normally aspirated 2.5 Mazda CX-5 has a similar 140kW/250Nm, with peak torque not arriving until much higher in the rev range than the Tucson. To its credit, the Hyundai doesn’t feel at all sluggish – maximum torque from 1500rpm gives it a strong mid-range – and its fuel consumption is about 1L/10km lower than the Ford’s. Matched is a seven-speed dual-clutch automatic gearbox, which is typically good under aggressive driving and better at reducing torque loss, but also feels a little hesitant and jerk-prone in day-to-day manoeuvring, and less smooth than the sequential AT in the Escape. Hyundai’s on-demand AWD system gets a locking mode at low speeds, though on the flip side offers 16mm less ground clearance. If you tow regularly and are interested in either of these vehicles, perhaps opt for the diesel versions (note, the Escape diesel gets a DCT). Both petrol versions have a 1600kg braked limit. Winner: Ford Escape, by a point. Hyundai Australia has long (quite rightly) made a concerted effort to publicise the extent to which it tunes the suspension of its cars for our market. The Tucson might just be its best work yet, with fantastic comfort over typical urban patchwork roads and sharp hits. The car just floats, despite the low-profile tyres and 19s. Given the fact that ride comfort and NVH suppression is a priority in the medium SUV class, the Tucson is very good indeed. The trade-off to that cosseting ride is a slight reduction in body control, as would be expected. There’s no wallowing, but against lateral forces the body does roll a little compared to overtly sporty offerings such as the Tiguan and, as we’ll discuss, the Escape. The Hyundai’s all-round independent suspension does a good job of maximising the contact patch, and the standard BLIS system along with the large windows is a blessing for merging. The Escape’s European origins – American name but Euro built – are obvious in the way the Ford handles. Its weight means it isn’t exactly nimble, but it’s very polished. Urban comfort is almost as impressive as the Hyundai, in terms of the way it isolates occupants from sharp hits, and the noise suppression is also excellent at a higher clip. Body control is a little more tied-down than the Hyundai’s, meaning it matches the engine’s nature by feeling a little sharper through corners than its bigger-selling rival. Ford’s Control Blade rear suspension does a good job of separating ride from handling, minimising the way that improvement in one tends to undermine the other. We would contend that buyers after a higher-specified SUV on 19-inch wheels care somewhat about performance in corners, and the way the Escape balances the two fundamental contradictory metrics makes it an appealing proposition. We’d also note that both cars have light electric steering with little communication. The Tucson’s turning circle of 10.6m is very good, and 60cm better than the Ford. It’s also easier to park as it’s easier to see out of. Winner: Ford again, only just. From an ownership perspective, Hyundai gives you an excellent (transferrable) five-year/unlimited kilometre warranty, complimentary sat nav updates for three years, free roadside assistance and lifetime advertised servicing prices. For MY18 Hyundai Australia has thankfully improved the turbo engine’s servicing intervals to 12 months or 10,000km (up from an average 7500km). We’re chasing the cost of each visit at the moment. By contrast, the Escape offers a three-year/100,000km warranty with roadside assist that is, like Hyundai, contingent on you getting your car serviced by a dealer. Servicing intervals are 12 months or 15,000km, with four of the first five visits each currently set at $375 (the 60,000km or fourth-year visit is $625). Winner : Hyundai. Though the Kia Sportage with a seven-year warranty beats them both. Tough call. Both of these sub-$50k medium SUVs are excellent, even factoring in the brand new just-launched Mazda CX-5 (comparison tests on this top-seller coming soon), the Kia Sportage and Volkswagen Tiguan kicking big goals, and a brand new Honda CR-V around the corner. The Hyundai Tucson, however, is best value in base Active and Active X forms, especially with its uprated normally aspirated drivetrain that’s better around town. That’s where the brilliant value truly lies. As a semi-premium offering the Ford Escape works better – its drivetrain and handling ensure this – and while we strongly criticise Ford for charging extra for active safety, it’s still the car that impressed us marginally more. The underdog takes the win, then.